Since I’m a teenager I have to wash my hair every day. Otherwise you will think I don’t have a shower at home, or you think I’m a caveman or whatever. So every day I have to wash my hair because it’s so greasy. I tried every shampoo against it but I’ve seen nothing really worked at all. I tried powders, baby shampoos, natural shampoo and the most expensive shampoo’s I’ve ever seen (a hair dresser said to me that the expensive one was THE one that could solve the problem and I believed her but sadly it didn’t work. It costed €15!!!!). The problem was only getting worse: when I was 14/15 years old, the day hadn’t ended yet and my hair was so oily that it looked like I hadn’t showered for days. I decided to cut my hair “short”. (I always had long hair and I cut my hair till it was on my shoulders) in hope my hair wouldn’t be so oily and heavy but that didn’t work either. So I was very sad that I cut my hair with no result. These 5 tips doesn’t solve the problem of greasy hair but it makes it a little less worse. But don’t expect it to be gone. 1. Do not brush you hair too often. Your hair comes in contact with your skin and the oil of the skin will stick on your hair which makes it looks wispy and oily. Brushing your hair in the morning and in the evening is enough. And if you want, you can change the routine of washing your hair. Do conditioner first and then use shampoo. People say it makes your hair less heavy because the shampoo will get the leftovers of conditioner out of your hair. Since I've changed my washing routine it feels like my hair is less heavy. 3. Don’t go too often with your hand through your hair. It will have the same effect as the brush and maybe even worse; if you eat something greasy and then go through your hair that will make your hair gets more oily than usual. If you always have you hair hanging lose then maybe you should try to wear your hair in a ponytail, a braid, a messy bun or tuck you hair behind your ears. This way you don’t have to touch your hair every time. 4. Try not to shower every day. I know this sounds disgusting when you have greasy hair and the first few years of the problem I didn’t follow to this tip because it just didn’t work then. They say that if you shower everyday it’s not good for you skin and it'll produce more oil because the natural oils get washed out everytime you shower. I’m trying this right now. And I do not see the results immediately but I think I have to be patient with this. I try to shower once in two days. And then I try to shower once in three days and hopefully I will get back to “normal” like 2 or 3 times a week. 5. Use dry shampoo. When your hair gets a little oily and you don’t want to shower immediately than this is the perfect invention ever!! Spray the dry shampoo in your hair, wait two minutes and then brush it. Your hair isn’t oily anymore and it will give your hair some volume. Don’t spray too much or too close on your hair. I did it once and my hair turned grey. Then I still had to shower and that was something I just wanted to avoid. But really this is a golden invention for everyone with greasy hair. 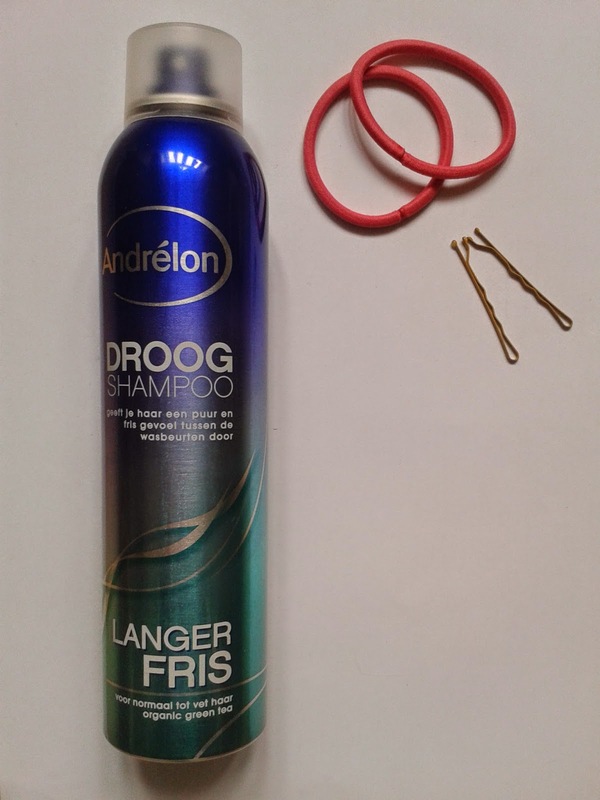 Right now I’m using the ‘Andrelon droogshampoo langer fris’ (Dutch brand). I hope this will help a little but the real tip is to have patients and wait. My hair was horrible for 4 years if I’m right and it’s getting a little better now I’m getting older. Step by step. I see that if I compare my hair today with four years ago I really see a change in going from very greasy hair to a little less greasy. It’s still not over but there is a change and I’m really happy about that. Four years is a long time to wait but I hope soon my hair is not that greasy anymore. Let me know what you do to get rid of your greasy hair. Share it and leave your tips in the comments below. Thanks! 4 comments on "5 tips against greasy hair"
Great post :) I can totally relate! I went through a phase when I was a teenager when my hair just seemed to be greasy permanently! I think some of it is hormonal as my hair is so much better now! I agree with everyyyything you've said here! I nominated you for the Sisterhood of the bloggers award! Haha I know! I always have to touch my hair!